The CG-G14PHHT is a USB3.1 Gen1 Industrial Hub that complies with Universal Serial Bus (USB) Specifications Revision 3.1 (Gen1) with up to 5Gbps data transmission. The USB 3.1 4 Port Hub operates with a wide temperature range from -40 to +85°C. It provides 4 downstream facing ports with standard A-type USB3.1 Gen 1 screw-lock connectors. 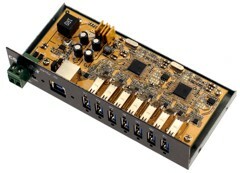 The industrial USB hub has a RISC-like USB3.1 Gen 1 controller; it is backward compatible when any one of downstream port is connected to an USB2.0/1.1 compliant device, or when the upstream port is connected to a USB2.0/1.1 compliant host. Supports keyboard, mouse, monitor, scanner, printer, PC Camera, telephone, DVD drive, joystick, virtual reality helmet, modem, PBX and many more USB devices. Supports 4 external USB3.1 Gen 1 Type-A connectors and 1 USB3.1 Gen 1 Type-B Upstream connector.